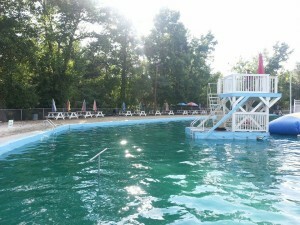 Pools | Hadad's Lake, Inc.
Hadad’s Lake has 3 pool sections where you can enjoy different activities. Two of the smaller sections are shallow (0 to 4 feet deep) and can be used by anyone to relax in. One side is equipped with a Basketball and Volleyball net while the other has inflatables for the kids to enjoy. The largest section of the pool has the deep end (16 feet) and it can be used for swimming or you can try out the rope swing, and the water tower/super launch. At Hadad’s, safety is a top concern to us, which is why we have lifeguards on duty whenever the pool is open. Anyone that goes into the Deep end is required to take a swim test. Anyone who uses the inflatables has to wear a life jacket. Hadad’s Lake has a small number of life jackets available (100+) for use. We recommend that if you own a life jacket, you bring it with you so you don’t have to wait to use the inflatables.